ECE ILLINOIS Associate Professor Sayan Mitra was featured in the Champaign-Urbana News-Gazette in an interview about his innovative start-up company. Mitra, along with CS Associate Professor Mahesh Viswanathan, are the founders of Rational CyPhy, Inc., which could improve the future of highway driving making it safer for everyone on the road. Photo by: Rick Danzl/The News-Gazette. 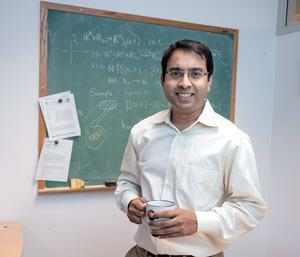 Associate Professor Sayan Mitra, co-owner of Rational CyPhy, Inc.
Their company is best known for creating tools that improve software in autonomous vehicles. Self-driving cars are expected to be released by the early 2020's, and companies like Google and Tesla have already logged over 200 million miles of autonomous freeway driving. The automotive industry has shown great interest in Mitra's company and their physics-based, data-driven approach. "Our core algorithms use small amounts of data to estimate how much the car's behavior can change as physical parameters vary," says Mitra. Rational CyPhy, Inc.'s methods help eliminate the need for many test scenarios and speed up the process of identifying potential issues in the software. The duo was recognized by the National Science Foundation last December and recieved $150,000 for their research on developing data-driven formal analysis techniques for control software. Their research not only benefits their own company, but their techniques can also be applied to other systems, such as drones and robots. The start-up does not have social media or a website quite yet for the public to follow, but you can learn more about Rational CyPhy, Inc. in Mitra's interview in the News Gazette.